The SecureZIP List Archive Contents action allows you to display the contents of an archive. To view the contents of an archive, specify the archive in the field provided on the List Archive Contents page. o Brief - Displays very basic information about the contents of the archive. o Normal - The default output. o Details - Displays detailed information about each file within the archive. o Log - Write the archive contents to the build log only. o File - Write the archive contents to a specified file only. o Log and File - Write the archive contents to both the build log and a specified file. 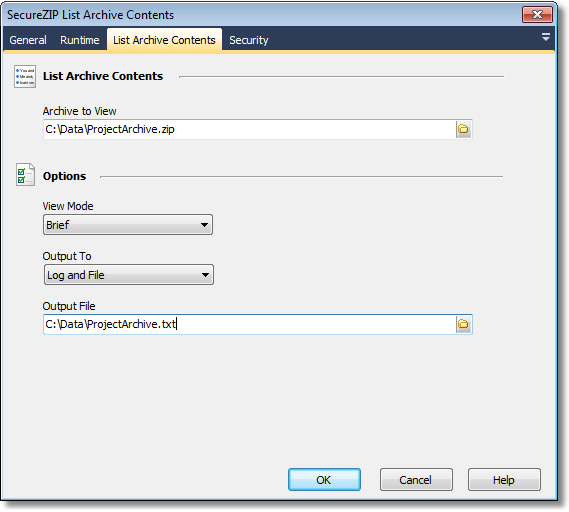 • To access a secure archive see the help for the SecureZIP Security Page.